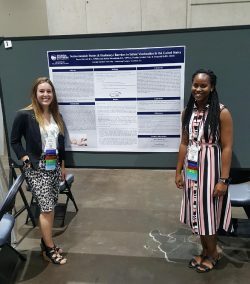 The Graduate Student Organization (GSO) is committed to representing and supporting the interests of all current and prospective graduate students at Georgia Southern University. The GSO seeks to support scholarly activities and professional development, as well as promote social opportunities for graduate students. All currently enrolled graduate students are members of the GSO. The GSO council consists of members from the graduate student body representing all colleges on the University’s campus. The council, the main governing body of the GSO, oversees the administration and awarding of research and travel grants and helps organize social events and professional development opportunities for graduate students. If you have any questions about the GSO or about the grant funding process, please contact us at gso@georgiasouthern.edu. Please enter your campus in the subject line of your email. The Graduate Student Professional Development Fund is a competitive funding source. Awards are NOT guaranteed; they are based entirely on merit and the applicant’s ability to present, in writing, the requirements for the funding opportunity. Following the guidelines does not guarantee an award. The application portal will open two weeks prior to the submission deadline. Only applications submitted in this period will be graded by the council. Please allow ten business days for decisions to be made about submitted proposals. *This is the final deadline for the academic year. All requests for summer funding must be received by this date. Failure to follow directions and formatting guidelines will result in an automatic rejection of your grant proposal submission. The Graduate Student Professional Development Fund (GSPDF) is a competitive funding opportunity for graduate students at Georgia Southern University (GS) managed by the Graduate Student Organization (GSO). This grant is designed to financially support students in travel to program-related events and in thesis or dissertation-related research while attending GS. Funding is awarded first and foremost on merit. Applicants must demonstrate, in writing, how the opportunity will further growth in their chosen discipline and as a professional in their field. Funding for this opportunity comes from the GSO operating budget for the fiscal year (July-June). Limited funds are available and are awarded in two categories: Research and Travel. There are two funding deadlines per semester in the academic year: September 17th, November 15th, February 15th, and April 1st. All funding submissions end at 5:00 PM EST the day of the deadline. Only one award per student per semester will be made. In an academic year, a student may only be awarded one research and one travel grant. Separate proposals must be submitted for research and travel grants. Submissions may be made by individuals only; no group submissions are accepted. All submitted grants must be novel and entirely separate from any other grants prior or present. Items Funded (including but not limited to): Research related materials, supplies, travel (e.g., mileage to and from research site), etc. Maximum award: $850.00 (Masters candidates) or $1000.00 (Doctoral and Specialist candidates). Research grant proposals should be written to highlight the merits of the proposed research with respect to the student, the discipline, the university, and society. Application for travel grants must be submitted no earlier than the semester before or no later than the semester after the travel event. If travel occurs during the summer, applications will be accepted during the spring and fall for the same year that travel occurs. Items Funded (including but not limited to): Travel related expenses to conferences or other program related events (e.g. mileage, airfare, conference fees). Maximum award: $625.00 (Masters candidates) or $850.00 (Doctoral and Specialist candidates). Travel grant proposals should be written to highlight the merits of the proposed travel with respect to the student, the discipline, the university, and society. The GSO must receive the completed online application package by the posted submission deadline. Please be sure to select your campus on the application. Each submission should be written and edited at a graduate level. Students should work closely with their advisor or major professor to devise a project budget and prepare materials for submission. Students must submit independent and unique proposals even if attending the same conference or doing the same research as another student or colleague. Any proposal containing plagiarized material, including submissions of previous proposals, will be automatically rejected and will result in the student’s inability to be considered for any future GSPDF grants. Applicants may only submit one travel grant and/or one research grant for each round of funding. Applicants who submit two or more travel grants, or two or more research grants, will not be considered for funding. For more details on how the council grades based on the guidelines listed below, view this presentation here. One PDF or Word document that includes Narrative, Budget Justification, and References (4.0 MB or less). To the extent permitted by law, the University will not release properly identified and marked technical or proprietary data. If the proposal contains proprietary information, clearly mark this information within the proposal with an asterisk at the beginning and end of the proprietary paragraph. Utilize a legend if necessary. An entire proposal should not be marked proprietary. Students should use their my.georgiasouthern.edu username and password to gain access. The narrative, budget justification, and references; supplies form; and budget worksheet should be uploaded into the corresponding sections of the GSPDF application. This form will contain all of your required materials and will be submitted electronically to finalize the process. 1.Applicants should NOT include personal identifying information in their application (this includes references to your program director, faculty advisor, program faculty, etc.). All submissions are subject to blind review by the council. 2. Narrative may not exceed 800 words or 4.0 MB. 4. Include the following sections, as applicable, with the appropriate content within each section. Include the headings (listed below) for each section. Provide a summary of your research project or travel. Include all pertinent background information to properly introduce the travel event or research topic. Reminder: Your audience comes from a diverse group of graduate students, please write accordingly. Provide the goal(s) of the proposed research or travel, hypotheses (if presenting or conducting research), and your expectations of the research or travel when applicable. If you are presenting during your travel, please give a brief description of your presentation. State why this research or travel is important to the greater community and how it contributes a deeper understanding of the proposed subject matter. Briefly outline the methodology and/or techniques that will be used to successfully conduct your research. Include supplies, minor equipment, instrumentation, and facilities information. Include a schedule in table format outlining key components of your research or travel. Research: Include expected landmark dates, time frames, and goals. Travel: Include a link to the entire conference itinerary and a provisional personal schedule of events to be attended. If no schedule is presently available at the time of your application, state that one is not available and include your departure and return dates. Provide rationale in paragraph form for all items outlined within the budget. Explain in detail the need for each item in order to attain the project or travel objective(s) and reflect the current cost of each item (these costs should match your budget worksheet). If traveling to a conference, reference the conference website for associated costs. If requesting per diem (e.g. meals, lodging, mileage) reference the official per diem reimbursement rates from the U.S. General Services Administration website. Budgets must be contained within a single fiscal year and expenditures must be made within the fiscal year (July-June). Research funds can be used over the course of the fiscal year awarded. A final travel report must be received within 14 business days after the requested travel dates (see below). All budgets and transactions must comply with Georgia Southern University expenditure policies. Reimbursement will be limited to the items on the original accepted budget. Any modifications to the original budget must be submitted to and approved by the GSPDF Committee. Please keep in mind that the Maximum Research award is $850.00 (Masters candidates) or $1000.00 (Doctoral and Specialist candidates); and the Maximum Travel award is $625.00 (Masters candidates) or $850.00 (Doctoral and Specialist candidates). For help understanding how to calculate the correct GSA per diem rates, use this “Per Diem Tool.” Information about in-state travel can be found on the State Accounting Office’s website. Meals and Lodging – Grant recipient’s name must be included on the hotel reservation. These cost of meals will be determined by the national per diem rate found U.S. General Services Administration website (GSA). Airfare – Only coach class will be reimbursed. Mileage – This will be reimbursed based on the current, state-approved mileage reimbursement rate. Only the person owning the vehicle will be awarded funds. The appropriate GSA per diem travel rates can be found here. Please note that travel costs are different if you are driving a personally owned vehicle or a government owned vehicle. DO NOT submit the cost of gas, only submit the GSA per diem mileage rates. Parking and Tolls – Use only low-cost long-term parking. Car Rental –This will only be approved if commercial transportation is not available or is more expensive. Hotel services – Such as laundry, valet services, safes, etc. Provide a comprehensive listing of relevant references for research and travel grant proposals. All borrowed material included in the proposal should contain a citation to the source. Please ensure all content in your proposal is cited in text and within the Reference section of the application. Plagiarized material will be automatically rejected and will result in the student’s inability to be considered for any future GSPDF grants. Complete the itemized budget request form located here. Upload as 1 Excel file. Do not include any identifying information in your worksheet. Do not save your the budget worksheet file with your name on it. Funding to support research costs may be requested when costs are not already budgeted and accounted for within other funding sources, such as departmental budget or external grants/contracts of the faculty advisor. In most cases, limited funding precludes the purchase of computers or basic computer equipment or software. For requests involving instrumentation and equipment, provide a description that specifies the availability and location of existing equipment, instrumentation, and physical facilities necessary to complete the research and provide a justification for why current University facilities are inadequate. Requests must justify the need for equipment and instrumentation in reaching the objective/goals of the student’s project and how it is essential in meeting the student’s research agenda. If research equipment is requested, please provide an instrument manufacture quote, as well as estimates for the continuing costs to operate and maintain the equipment and how these costs are to be covered. All equipment will remain property of Georgia Southern. Upload as 1 Word or PDF document. If you need human subject approval, via the Institutional Review Board (IRB), or animal use approval, via the Institutional Animal Care and Use Committee (IACUC), you must include documentation. If IRB approval has not been received at the time of submission, there must be a plan for such approval described within the proposal. If the proposal is funded, approval must be secured before funds are disbursed to the awardee. All submissions are electronic. The applicant should ensure that they have completed, to the specifications laid out above, their application package. Once the application is complete the student must log on to the GSO website in order to submit a GSPDF proposal. Students should use their mygsu username and password to gain access. The completion of the online form will require the input/upload of all application materials. Finalize your submission by selecting the submit button. Proposals are forwarded to the GSPDF Committee for review if they meet proposal preparation requirements as described above. Failure to adhere to the formatting outlined in the guidelines will result in a rejected proposal. Each proposal meeting all guideline criteria is reviewed by the committee and scored according to a grading rubric. The GSPDF Committee may recommend full funding or no funding. All submitted grant proposals must be novel and entirely separate from any other proposal. Reviewer comments will be provided for applicants following the determination of award. We encourage those with rejected proposals to resubmit to future funding rounds. Awards are given in two formats: lump sum and reimbursements. Travel awards are given as a lump sum. Research awards may be given as a reimbursement for purchases or students may elect to work with the Director of Graduate Student Services to make purchases. In either case, all purchases must be vetted and approved by the Director of Graduate Student Services prior to purchases being made and all funds must be spent by May 1st so that they are allocated in the current fiscal year. Failure to spend requested funds will result in a loss of those funds. A one-page narrative of the experience must be scanned and submitted to the College of Graduate Studies no later than 14 business days after the travel or research has been completed (based on the submitted timeline). Email to gso@georgiasouthern.edu. Applicants will be notified of an award or denial via a formal letter via email from the GSO. Every effort is made to notify applicants of award decisions within 10 business days of the submission deadline. Students awarded a GSPDF award must submit a comprehensive final report (minimum of 1 page) within 14 business days of the conclusion of the travel or research. The final report should provide information on activities and findings and the effects on the student’s educational and professional life. Failure to submit this report will result in the inability to receive reimbursements or future funding. Email to gso@georgiasouthern.edu. Only budgeted and allowable costs may be incurred. Requests to alter the scope of work or to re-budget costs are strongly discouraged and must be presented in writing to the GSPDF committee. There is no guarantee that awardee requests for alterations in scope of work or budgets will be allowed. For students traveling with GSPDF funding, the final travel report is due no later than 14 business days after the conclusion of travel. For students conducting research with GSPDF funding, all purchases must spent prior to May 15 to comply with end-of-year fiscal deadlines. Any funding not used in the fiscal year in which it was awarded will be forfeited. 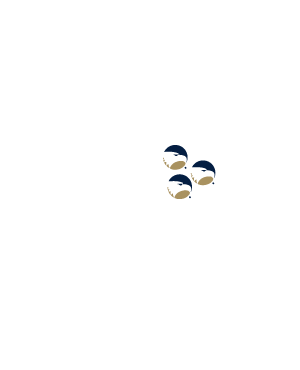 Any and all supplies, consumables, equipment or other goods purchased under the GSPDF remain the property of Georgia Southern University to be retained and inventoried by the student’s home department. GSPDF awarded presentations and publications should have the funding source acknowledged. If you receive a grant related to international travel, you must complete the request for Authority to Travel form located here. No awarded funds will be dispersed until this form is received by the College of Graduate Studies. Research proposals that are requesting funds to travel should submit this form as well. Please secure all signatures and submit the Authority to Travel form to COGS. If you have ANY questions about your grant proposal, kindly send a message to the Graduate Student Organization at gso@georgiasouthern.edu. Please enter your campus in the subject line of your email. We as a council do not have formal office hours, but arrangements can be made if necessary. 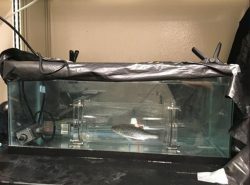 Image 1: Striped bass in the respirometry chamber where we measured aerobic metabolic scope. Image 2: Daniel performing respirometry on a striped bass. Image 3: Daniel presenting at the annual meeting of the Georgia Chapter of the American Fisheries Society. Q: What was the purpose of your GSO grant? How did the grant assist you in completing our travel/research? 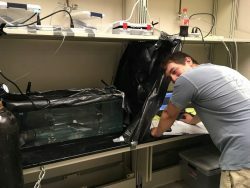 A: In spring 2018, I was awarded funding for research materials which were used to analyze metabolites in striped bass as determinants of thermal stress. Thanks to the funds provided by the GSO, I was able to initiate my research in a timely manner and complete my research prior to the expected date. 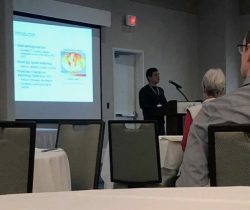 In spring 2019, I was awarded funding to travel to the annual meeting of the Georgia Chapter of the American Fisheries Society where I presented my thesis project titled “Thermal and low oxygen tolerance of a southern population of striped bass (Morone saxatilis).” This opportunity gave me valuable experience presenting my thesis project prior to my defense in the summer of 2019. Q: What advice would you give for those applying for travel/research funds from the GSO? A: I am very thankful for the tremendous support provided by the GSO and encourage other students to take advantage of such an incredible opportunity. I prepared a short list of pointers that helped me tremendously during my application process and hope others may find it helpful in the future. Be concise – Most grant proposals have a word limit that the reviewers strictly adhere to. It is important that you summarize your research/travel in as few words as possible without leaving out important information. Avoid over explaining and simply go directly to the point. Be mindful of deadlines – Preparation is key. Do not procrastinate and wait until the last minute to submit your proposal. Try to complete it beforehand so you have time to review your proposal. Let your thesis adviser or other colleagues read your work and give you suggestions. Also keep in mind that most proposals require endorsement letters from your adviser or other faculty. Make sure you give them plenty of time to complete this! Know your audience – In the case of the GSO proposal, your work will be analyzed by students in a variety of fields and concentrations. Don’t use jargon specific to your field! This will confuse the reviewers and make your writing hard to follow. Try to simplify your proposal in terms that someone that is unfamiliar with the field can understand. If possible, get people from other majors or concentrations to read your proposal and see if they can follow along. Follow instructions carefully – Grant submissions guidelines will be given in most cases. Follow the instructions word by word! If you’re confused about something ask the appropriate person for clarification, don’t just wing it. Make sure all the required components are complete prior to submission. Bring it all together – Clearly describe why you need funding, how funding will help your travel/research, and how the completion of your travel/research will benefit your professional development within your field. Make sure that these three components come together in a clear and efficient manner. This is your argument and you need to make it as direct as possible for the reviewers. A: I received a GSO grant for my travel to a national physical therapy conference, in Washington, D.C., to present my research project. The grant assisted me with travel costs such as flights, lodging, transportation, and meals. Without it, I would not have been able to present my research at this prestigious conference. A: My advice to those who are applying for GSO funds would be to start the process as early as possible. The application process requires detailed information about your travel/research and must be written at a graduate/professional level. The applicant must commit the time needed to submit a well-planned application. Another reason to start the process early is to ensure that you receive the funds in time to purchase flights, hotel rooms, etc. A: GSO Grant allowed me to fly out to the west coast in San Diego, CA for the biggest national public health conference (APHA). There I was able to present my research and connect with multiple publishers and advocates in public health. Due to this amazing opportunity, my research partner (Darnel Howlett) and myself were able to receive our award for best graduate poster in-person at the event! A: My advice is to make sure to read the grant instructions and make sure you proofread your work. There are so many financial resources available at all levels of education, but you must put in the effort to receive the assistance. A: The purpose of my GSO grant was to aid in the funding of research for my dissertation in partial fulfillment of the requirements for the degree Doctor of Psychology. The GSO grant I received allowed me the ability to pursue my research goals related to assessing and improving the lives of individuals residing in poverty. Specifically, as a result of receiving this grant, I will be able to improve the research base related to individuals from rural and urban areas who are residing in poverty. A: My advice to those who are applying for travel/research funds from GSO is to be thorough in the application process and to seek advisement whenever possible. In doing so, you will build meaningful connections and also gain meaningful experience. I would also say to aim high and never stop working hard to achieve your goals! 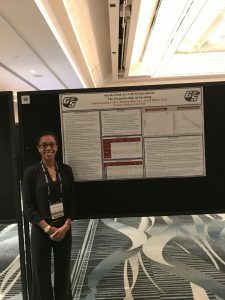 A: I applied for the GSO grant in order to financially assist my travel to the annual Association for Applied Sport Psychology conference, where I presented a poster with a fellow colleague from my undergraduate institution. Being that the conference was held in Toronto, ON, CA this year, there were many added expenses, including international air travel, the exchange rate, and food and hotel costs. A: One piece of advice I would give to students applying for travel/research funds from the GSO would be to read and follow the directions posted online very closely. I also suggest that students ask questions to the GSO if they are unsure. I was able to get all my questions answered about international travel from Ms. Audie, who was extremely helpful during this process. Finally, I suggest that students ask fellow master’s students about their experience applying; the second-year students in my program were able to help make the process a little bit easier. 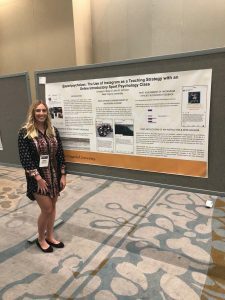 A: I was awarded a Graduate Student Organization grant to travel to Tampa Florida for the annual Society of Integrative and Comparative Biology conference. This grant allowed me to attend and travel to the conference. This opportunity gave me a chance to network with many professionals in my field and see what research others in my field are currently doing. I gained many valuable interactions that will strengthen my research and make my research more appealing to an even broader audience. A: One of the most important things I learned while creating this grant application is that triple checking to make sure all of your formatting is correct is crucial. Also, being able to convey the importance of the work you do and how the opportunity that the grant will afford you will enhance your work will make your application much more appealing.